From the evil mind who brought us Nacho Matt – Pete “the hafwit” Bretzke. That is, without a doubt, the best of the web! Hillarious, where is the mini Matt ? No mini Matt, it’s a very tight budget here on MBW. NOW that if funny….can you fix it so we can blow it up, can’t read the caption? That’s part of my evil plot…making people squint to read my evil plot!! 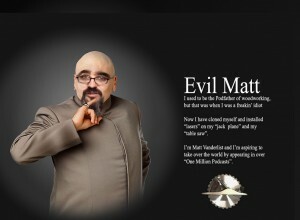 Matt is planing to take over the world, we have to stop him. Bench dogs with friggin’ lasers on their head!